Red Bull energy drink is designed to increase performance during physical and mental exertion. Red Bull claims its products increase performance, concentration, reaction speed, and vigilance, as well as improve mood and stimulate metabolism. Scientific studies using Red Bull and the ingredients in the product support these claims. The active ingredient in Red Bull is caffeine, a mild stimulant also found in coffee and tea that can increase metabolism, concentration, reaction time and energy. Caffeine can be addictive, and withdrawal symptoms include headaches and irritability. Red Bull contains taurine, an amino acid that has many functions. It regulates levels of waters and salt in the body, as it can form into bile salts. It works as an inhibitory neurotransmitter in the brain and can also affect learning and memory. Taurine is also an antioxidant and may play a role in formation of fat tissue. Red bull contains glucuronolactone, a chemical made naturally in the body when glucose is metabolized. Glucuronolactone may fight fatigue and it is present in many energy drinks. Red Bull contains several B vitamins. Niacinamide, better known as niacin or vitamin B-3, is necessary for metabolism as well as DNA repair and production of steroid hormones. Calcium pantothenate, better known as pantothenic acid or vitamin B-5, is necessary to make co-enzyme A as well as synthesize proteins, fats and carbohydrates. Pyroxidine HCL, better known as vitamin B-6, is necessary for protein metabolism and the reaction converting glycogen to glucose. Vitamin B-12, also known as cobalamin, is necessary for metabolism, blood formation and fatty acid production. 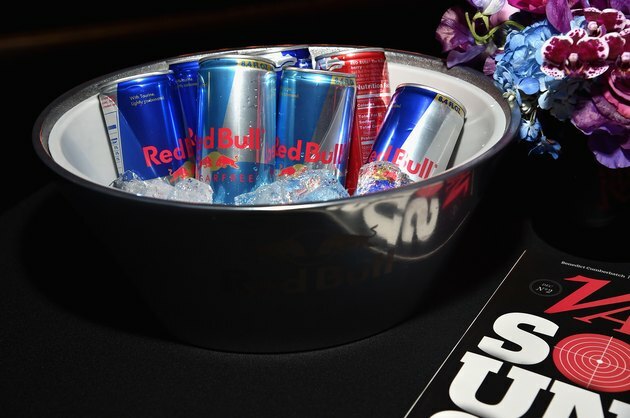 Red Bull contains two types of sugar: glucose and sucrose, as well as artificial flavorings. A sugar-free Red Bull sweetened with artificial sugar is also available. Red Bull also contains carbonated water, artificial colors, sodium citrate and instol. Carbonated water provides the carbonation in Red Bull, artificial coloring makes it yellowish, sodium citrate is a preservative, and inositol, which is a carbohydrate.